Sherwood Restorations was initially founded in 1966, specialising in pure restoration of mainly pre-war cars with Bugatti’s being the main stay of the company at that time. The sales side of the business was to appear at a much later stage. Originally working in small workshops in Blidworth, the need for expansion and more space meant that eventually, a move was required, resulting in the transition to a factory unit in Dalestorth Road, Sutton-in-Ashfield in Nottinghamshire. Here, Bugatti’s played a major part in building the profile and reputation of what was then one of the leading restoration specialists in the UK. The early 90’s saw quite a dramatic change within the ‘classic car’ market with the demand for restoration diminishing somewhat. So, the decision was made to diversify more towards the sale of ‘classic cars’, but at the same time, provide full workshop facilities to enable the maintenance and restoration side of the company to continue alongside the vehicle sales. So, in 1996 new premises were acquired. Being an original garage since 1932 and being situated in the picturesque minster town of Southwell, meant that part of local history would continue, gradually becoming a very popular location for folk, young and old, from near and far. This still continues today, with many ‘regulars’ often visiting for their regular dose of nostalgia! 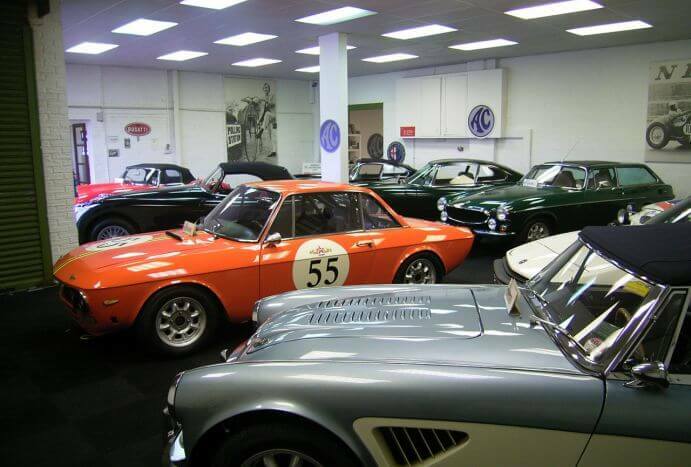 Originally a small showroom with inadequate workshop space behind, the ever increasing demand for ‘proper’ classic cars saw a gradual redevelopment of the site commencing in 2001. Much larger and more modern workshop facilities were built to cope with demand and the showroom was doubled in size, encompassing the old workshop, providing the much needed space to display our stock to its best advantage. Recent increased demand has seen the appearance of our new, purpose built storage facility, which was completed towards the end of 2010. As our reputation continues to grow, not only on a local basis, but also worldwide, we are safe in the knowledge that, our expertise and professionalism, ensures that our clients’ expectations will not only be met, but constantly exceeded. Continued sucess within the ever increasing ‘classic car’ market means that Sherwood Restorations Ltd., is now at the forefront of one of the most interesting and iconic industries existing today. Whatever people may say, I can assure you that ‘nostalgia’ is definitely not a thing of the past, but very much of the future! My father, Paul Haywood Halfpenny passed away in April 2016. I was very lucky to be able to have worked alongside him for over 20 years in the business. Learning from his vast knowledge of Classic/Vintage cars and engineering was an invaluable treasure trove. Looking back now I see how incredibly lucky we all were here at Sherwood Restorations to have worked with him. Not only did he run this very successful business, he had, in his rare spare time, a chance to race some amazing cars over some of the greatest circuits in Europe. Owning and racing the ex Gerry Marshall ‘Baby Bertha’ Special Saloon, to competing at the Le Mans Classic in the prototype GT40, Lola Mk6 were definite highlights. Since his passing, the company and myself have carried on the pursuit of buying, maintaining and restoring classic and sports cars to the best of our abilities. This I am sure Dad would be proud of. I do hope that those of you who knew him or those who are classic car enthusiasts, come and visit us here for a chat or even better, to buy a classic car!. As the Managing Director’s son, it was only a matter of time before I was to follow in father’s footsteps and join the ranks! I was raised on cars, racing, restoring, buying, selling, etc. etc. All were an everyday occurrence and all passions, that in time, will hopefully rub off on my own youngster. Immediately after leaving school, an interest in art and design led me on a brief but interesting two years at college, before returning to continue my indulgence with classic vehicles. Running the mechanical side of the business and the preparation of the vehicles prior to sale, gives me the insight into, what is for myself, the more interesting aspect of classic car market. Looking to the future, my aim is to assist with the ever increasing demand that is put upon us on a daily basis and help to preserve our motoring heritage. I joined Sherwood Restorations as Sales Manager in 1997, after many years in the ‘mainstream’ motor trade. The move enabled me to continue a passion for cars which has evolved over many years. My main interest is in Street / Hot Rods, having been extensively involved for many years on a club basis, running major shows and writing for magazines, as well as owning and running many well known examples. I see the move to ‘classic cars’ as a natural progression, with a crossover becoming more and more evident with many rods now appearing within the classic car scene and also commanding higher and higher prices. Being within the ‘classic’ environment is not like going to work. Every day is different and every vehicle that appears has its own makeup and is therefore by its own nature, unique. Entering our ‘toy shop’, and being able to play with the contents, for many would be a dream come true. It is a privilege that I appreciate and respect. Long may it continue. I joined Paul at the tender age of 21 after working at Morkel & Carnill and Trumans of Nottingham, serving my apprenticeship on such exotica as E-Types and the like. Working in and running the workshops soon led to what has now become a lifetime’s experience, working on vehicles that are far from the mundane and constantly providing the challenges that I have come to know and enjoy. No two days are ever the same! After 38 years it still amazes me what comes around the corner and what problems arise, none of which are insurmountable. From my early days, the passing of time and the experience that I have had, has now taught me every aspect of restoration and all that it throws at us. From general mechanics through to full resprays, engine rebuilds, trim etc. etc. All are now well within my capabilities, and it is a pleasure to be able to put my name to some of the most historic and important classic cars that are once again, back on the road. We have known Niki for a long time now, having been a painter and fabricator for over 10 years. Niki managed and ran a successful paint shop business for a number of years, before we managed to persuade him to join the Sherwood Restorations family, where his hard working attributes and approachable personality make him an essential part of the team. I must compliment the team at Sherwood and praise the friendly enthusiastic service you offer. I have been doing business with Sherwood for many years now and all the cars I have bought are excellently prepared sorted vehicles, which are well presented and in my opinion have been some of the best examples available. Not only are the sales staff extremely knowledgeable but the service and restoration side are equally as competent. Firstly, a big thank you for finding me a very nice MGC roadster, and for being so kind as to deliver it by trailer in the middle of winter, so as to save it getting covered in deadly salt and grime! I look forward greatly for some drier and brighter weather so I can start to get to know it better! In the mean time I shall get the polish out and give it some personal attention (not that it needs it – it was spick and span when it arrived, but you know what we enthusiasts are…). This of course makes five really nice cars you have sold me over the years, and as you know I have already put in a request for a sixth – but Jackie says don’t be too quick to find it! Cheers for now. Having a life long interest in cars it has been a natural progression for me to follow on to classic cars. In my quest for accurately described quality classics, I had been continuously disappointed by the offerings of both private and trade sellers, until I arrived on your doorstep. My conversation with you was about developing a personal relationship based on trust, honesty and fairness. I have to say, that following these few years together and the purchase of four cars from you, I have not been at all disappointed. During our periodic conversations I feel we have confirmed that we have so much common historic ground. This is probably because we are of similar ages but more likely that we have a nostalgic love of the cars of our ‘childhoods’! With every car that I have bought from you, you have supported me without fail when I have discovered a ‘problem’ that I considered you should address, for that I thank you. Similarly Charles, Alex and Ken, your long suffering team are a delight to deal with and you have all come up to my expectations without exception. Independent Vehicle Inspections. 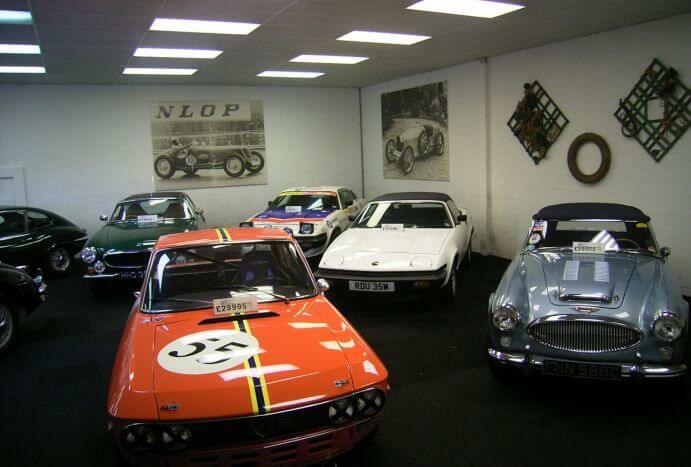 All Classic Cars Inspected – RAC Approved. Sureterm Direct Insurance Specialists. Sureterm Direct is one of the best-known names in specialist insurance. Specialist Car Insurance broker in the UK offering cheap classic car insurance quotes and policies for all risks including hot hatch, modified, classic and vintage cars. The leading quality magazine focusing on the greatest classic & performance cars.